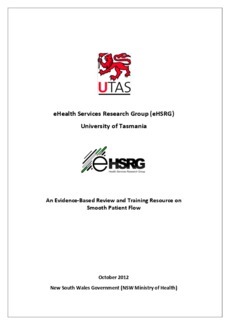 This document provides an evidence-based review and training resource on smooth patient flow and is the first project part of a broader collaborative study on smooth patient flow education. The evidence it presents supports a system focused approach to patient flow. This approach facilitates improved understanding, identification and resolution of delays to patient care within hospitals and directly contributes to ensuring the delivery of high quality, safe and timely care to patients. Smooth patient flow is a set of processes, rather than a specific destination. These processes involve all hospital staff at different times (as well as patients and their families) in a variety of different ways (operational, tactical, and strategic). This resource aims to contribute directly to improving understanding of these processes as well as the inter-relationships between them and about the best ways of releasing capacity from the current system through the better management of patients during the provision of health services. It is anticipated that this resource will support healthcare professionals in NSW hospitals to reflect on how their work practices, and the work practices of others impact on flow and to recognise how flow issues relate to the quality and safety of care. This resource also aims to raise awareness and understanding on how smooth flow can sustainably release system capacity by reducing waste, duplication and delay in the provision of health services. More broadly, it is hoped that this resource will also be useful for other healthcare professionals, improvement specialists and researchers in this field in Australia and Internationally.